Running out of hard drive space on your PC used to be a problem. It usually meant you had to get a new PC, or offload some files onto an external hard disk, or upgrade your internal drive. All three options were pretty much a pain. Cloud storage services haven't solved these hassles completely, but they are making it easier to clear up some space on your hard drive. Google Drive and Microsoft's OneDrive drive are offering ever increasing amounts of free (and free-ish) storage. New Google Drive users start off with 15GB, as do OneDrive users. If you happen to be an Office 365 subscriber you get unlimited storage on OneDrive as part of your subscription. 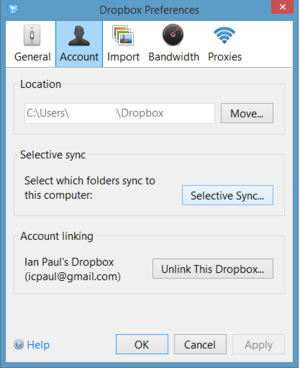 Dropbox is still comparatively stingy with 2GB of free space, but most users quickly bump that up to 5GB or more with various giveaways and incentives from the company, which leaps all the way to 1TB with a $10 per month or $100 per year subscription. All three services let you get selective about which files you bring down from the cloud to your desktop. That means you can leave some stuff in your cloud drive and only download it when necessary. Let's explain how to do that, and considerations to keep in mind before you start stashing your valuable files on third-party servers alone. Keeping stuff in OneDrive and not on your Windows 8.1 desktop is as simple as a right-click. For Windows 8.1 users, keeping stuff up in the cloud with OneDrive is fairly easy. Open OneDrive in Windows Explorer. Anything under the category heading Availability (in Details View) that says Available offline is stored on your hard drive. If it says Online-only it's in the cloud, which is the default. To switch anything that's on your hard drive to online-only, just right-click it and select Make available online-only. The file will disappear from your hard drive, but remain available for downloading from the cloud via Windows Explorer any time you need it. Online-only files will still appear when you open the OneDrive folder in Windows Explorer, but the icons are just small 'pointers' to let you know they're available in your cloud storage space. Opening an online-only file will download a local copy of the file and open it. Google Drive lets you selectively sync folders. To do the same in Google Drive, click the upward facing arrow in the lower right corner of the taskbar. 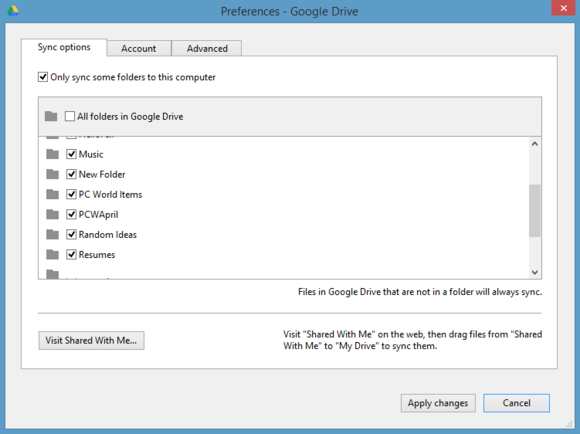 Find the Google Drive icon, right-click it, and select Preferences... Under the Sync options tab check the box that says Only sync some folders to this computer. Then click the folders you want to keep on your hard drive and click Apply changes. The rest will again be gone from your hard drive, but still available in the cloud. Click Dropbox's Selective Sync... button to move folders off your hard drive. Yet another window opens with a list of folders on your PC. Just de-select the folders that you don't want to keep on your hard drive and click Update, then OK. In the case of both Dropbox and Google Drive you can always access files not on your hard drive by visiting the website for each service. Now that you know how to leave your files up in the cloud, the question is what should you leave up there? If you have a large amount of cloud storage the easiest option is to offload large files that aren't used very often, such as videos or pictures. Those with less storage may have to be more selective, possibly even choosing a mix of documents, photos, and videos. It's unlikely that your files will disappear from the servers of Dropbox, Google, Microsoft, or any other well known cloud storage provider. Nevertheless, it's still wise to make your own backup of cloud-stored files on an external drive in your own home or, at the very least, with another cloud storage or cloud back-up provider. Also, keep in mind that once you start depending on the cloud to be your primary storage for personal photos and documents, it pays to maintain the best security you can. Dropbox, Google, and Microsoft all offer two-factor authentication. Make sure you use it. Your password should also be at least 10-12 characters long and completely random. Use a password manager like KeePass or LastPass to store your passwords if you're worried you'll forget it. Other than that there are also the privacy implications of storing personal data in the cloud. But you've probably already considered that since you're using cloud storage to begin with.